The women’s basketball team beat Duquesne and Dayton before losing to Xavier by two points. The women’s basketball team needed just one more basket. One more basket would have sent Temple into double overtime with No. 5 Xavier or given the Owls the Atlantic Ten Tournament title. With five seconds remaining in overtime, the Owls came out of a timeout with possession of the ball. They trailed the A-10 Tournament’s No. 1-seeded team, 57-55. Junior guard Shaqwedia Wallace charged into the lane hoping to score a layup at the buzzer or draw a foul. Her shot did not go in, and the referees did not call a foul. Xavier won the A-10 Championship. ANNA ZHILKOVA TTN Sophomore forward Kristen McCarthy dribbles through two Xavier defenders in last Monday’s Championship. The Owls got off to a rough start against the Musketeers, who opened the game on a 14-0 run. That run allowed Xavier to get on a roll. The Musketeers led, 32-20, at halftime. Temple mounted a fierce comeback after halftime with a 13-1 run that closed the gap. 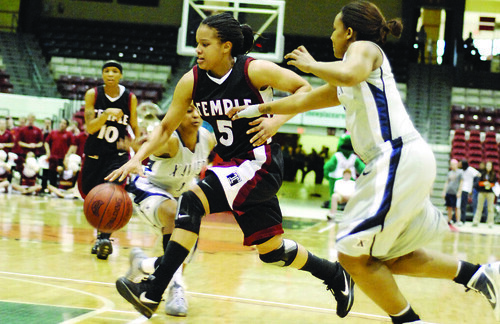 The Owls also adjusted defensively by double-teaming Xavier’s leading scorer, redshirt junior forward Amber Harris. Wallace and sophomore forward Kristen McCarthy came alive offensively and led the Owls with 18 and 17 points, respectively. On the defensive end, junior forward Marli Bennett and Eaddy combined for six steals, while senior center Jasmine Stone pulled down 17 rebounds. Despite the Owls’ efforts, Xavier held on for the win. The Musketeers rode a 23-point performance from Harris, who finished the season as the A-10 Player of the Year and earned the A-10 Tournament’s Most Outstanding Player. Phillips provided a presence in the paint with nine points and 21 rebounds. To make it to the championship round, the Owls dispatched Duquesne, 63-54, in the quarterfinal round after receiving a first-round bye. In the semifinal round, Temple pushed past Dayton, 67-64 in overtime, thanks to two free throws from Eaddy with nine seconds left in the extra period. McCarthy and Eaddy both earned end-of-the-season accolades from the A-10. McCarthy was named to the First Team All A-10 Team, while Eaddy was named on the Third Team All A-10 Team and the A-10 Defensive Team. Both players were also named to the All-Tournament Team.